In some courageous genre bending, the Oakland Symphony teamed up with Hip-Hop artist Kev Choice at Oakland’s Paramount Theater last Friday, March 23. The results were mixed, with deep sentiments, sparkling runs, and sometimes bland arrangements, but the crowd lapped it up and demanded more. Kev Choice introduced Hip-Hop into the classical world of the Oakland Symphony on March 23, 2018. Titled “Rooted in Oakland,” the night was maestro Michael Morgan’s homage to his adopted home, celebrating the resilience and future of the arts and his long support for them. That future was strongly on display as Oakland middle and high school students joined the Oakland Symphony onstage for the first piece, Gioachino Rossini’s overture to The Barber of Seville. Here, not only did the young artists of the MUSE VIVO Orchestra share music stands with veterans, but in the violins they were placed on the side closest to the audience, the honored “firsts” position, while the orchestra regulars turned pages. And when not turning pages, those regulars leaned in and exaggerated their bowing with flourishes to encourage tight entrances, beaming all the while. Reading about the back story in the excellent program notes by Charley Samson, one learned that Rossini actually lost his Prelude somewhere on the road between Rome and Bologna after a premiere marred by every kind of stage catastrophe (including a cat wandering onstage and hiding under the skirts of the Prima Donna). Rossini worked up this prelude from older material, and it is the version that we know today, full of tart sweetness and youthful frolics and a fine metaphor for the onstage mentoring. After the youths left, but furthering that sense of the springtime of life, Michael Morgan led the regulars in Schubert’s Symphony No. 5, written when Schubert was just 19. This was his homage to the greats of his own era, and filled with light. After the fearless beauty of the opening movement, the Andante was sedate and sunny, a very model of Haydn in its careful balances. Then the Menuetto turned to the influences of Mozart and Beethoven with its languorous phrases and forceful dynamics. Those three teachers came together in the Allegro, with its delicacy and endless variations to match passages of lean muscle. After a pause Morgan continued, “It feels wonderful to support this new generation of musicians. And tomorrow I will be in Washington DC to support them!” He referred to the next day’s march in sympathy with the victims of gun violence in the schools, the budding “choose life” movement. The audience cheered and clapped for many long minutes, and it was clear that he had struck a nerve, particularly among the parents of students in the audience (and that included relatives of performers from the Oakland School for the Arts, whose chorus was featured in the final work). The next day it was even clearer that this was a seminal moment, with young people marching in every state of the USA and speaking eloquently from their hearts. The clapping finally subsided and Morgan led that brisk flower of Romanticism, and it was surprising that Bristow had fallen into disuse. His Overture opened with big florid gestures, and then sensitive flutes and oboes peeked out over string tremolos. There was grandeur and lightness and accessibility, and the orchestra was superbly tight. And finally, Morgan welcomed Kev Choice to the stage for the premiere of his Soul Restoration Suite, a work commissioned by the Oakland Symphony for orchestra, Hip-Hop artist, band, and the chorus of the Oakland School for the Arts. This was a work of looping phrases and a gentle but well-defined beat, beginning with vocalise (OSA chorus singing open vowels) and then Choice adding his own rap on Oakland’s long history, culminating in phrases that alluded to modern life’s mix of camaraderie and hardness. “Soul brother, soul sister, sole survivor,” Choice sang. He followed with long and sparkling piano runs, like Scarlatti tinged with jazz or Rachmaninov filtered through minimalism, and then moved to the front of the stage for raps while the orchestra kept the motion. This felt almost like a club scene, with the audience clapping every time they came to a full stop and everyone swaying, including the conductor. After long applause Choice said, “That was just the opening!” and led them in more movements, this time using lyrics from his own works while the chorus sang, “They can’t take this love from us.” He had an audience of 2,200 people clapping along! The Oakland Symphony is rich fare. Between Michael Morgan’s artistic imperative to have fun and programming that fearlessly bends genres, along with the Beaux Art extravagance of the Paramount and the multigenerational and multicultural audience, it feels like coming home. Choice’s piece was clearly designed to bring all of this – and all of us – together. 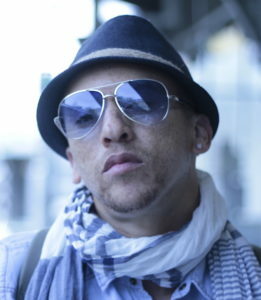 Photo above of Kev Choice, courtesy of the artist’s website.